And now do it again with plain nightly build. @5D3.123 owners in possession of a 1066x card: Do a benchmark run in photo mode outside liveview and post results (best convert BENCHx.PPM to PNG and link it here). "Plain vanilla" in this case means a Nightly or "unified branch" build. In other words, something basic that is not experimental or modified in any way. One of Danne's builds would go beyond experimental into what is know as a "bleeding edge" build. @timbytheriver: There is one test left. 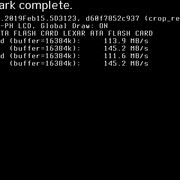 I'm guessing you have ML installed on your SD-card and use your CF for storing data. If so: Run ML with CF only and redo benchmark test. Don't expect the numbers to change. It's just the final test before replacing the card. Write speed seems not what advertised. Bad card maybe. @Danne Yes! Or a fake one… Just noticed mine says 'Made in Vietnam' in tiny printed letters. Doesn't have to mean anything. We live in a global economy and production sites may be spread all over the world. IMO the whole "Made in ..." thingy is worthless today. And Lexar Brand is owned by chinese company Longsys since 2017. No way (yet) to tell if there is a difference between cards made in different locations. @Walter I guess. I will certainly contact the seller with the evidence. Some manufacturer, same ID line and long before transfer of brand to China. May I ask for a favour? Can you share (= for common use) some high-res photos of the card (CR2 preferred) showing label and front side? I might come up with a tutorial/primer about cards for ML and might be able to use such pics. Just received new KomputerBay 1066x 128gb from Amazon. Benchmark much more respectable. Test @45fps continuous (green) 1080p fine. Strange that is shows the same ID line as the Lexar though… Odd. Are IRND filters recommended for the 5Diii? Or is it effective with IR cut?